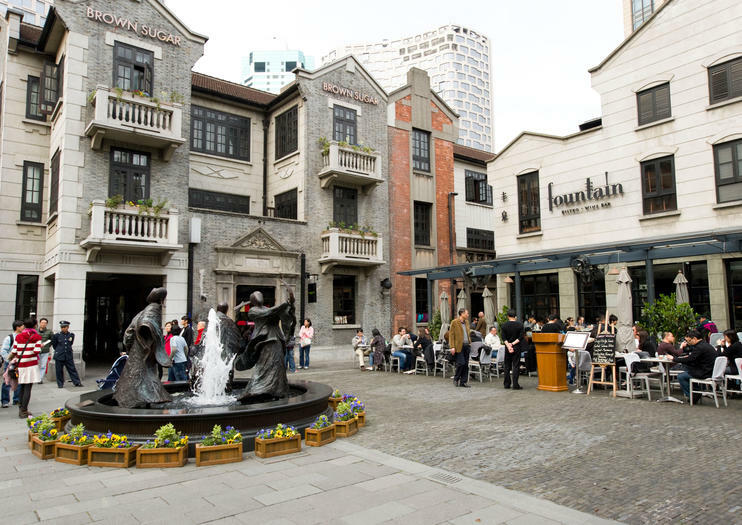 A vibrant mix of old and new, Shanghai Xin Tian Di is a fashionable and upscale area full of modern and trendy shops, galleries, cafes, restaurants, bars, and clubs, many housed within traditional Shikumen buildings that have been restored. It’s a place to see and be seen, and a popular destination for locals and tourists alike. Completed in 2002, Xin Tian Di (the name means “New Heaven and Earth”) covers about two city blocks. It’s one of Shanghai’s most popular entertainment and lifestyle destinations, and many tours feature a stop here. Take a guided walking, bike, or bus tour to explore the area, or pair it with other top attractions in Shanghai, such as City God Temple, Yuyuan Garden, or the Bund. Alternatively, some travelers opt to combine it with a nighttime Huangpu River cruise or an acrobatic show. For a more personalized experience, book a private or small-group tour. Xin Tian Di is a must-visit for foodies, shoppers, and those with an interest in architecture. Visitors can find both Chinese and Western restaurants in the area. Many restaurants offer free WiFi to customers. Xin Tian Di is located in central Shanghai, south of Huaihai Zhong Lu. Take the metro, line 10 or 13, and get off at Xintiandi Station (exit 6). Or take the City Sightseeing Bus, line 1, to Yida Huizhi Xintiandi, or bus 146 or 805 to Madang Road, Xingye Road. Xin Tian Di can be visited at any time, though shops, restaurants, and other business will have different closing times. Those interested in the architecture should visit during the day. There’s a vibrant nightlife scene here, and it’s possible to eat, drink, and be merry into the wee hours. The inspiration for the architecture of Xin Tian Di came from the site where the Chinese Communist Party first met in 1921, in a gray building that sits in the middle of Xin Tian Di. This building is now the Museum of the First National Congress Hall of the Communist Party, and visitors can see a waxwork replica of that first meeting, along with an exhibition hall full of relics, documents, and photos.